I bought a few items a while back but I think only one since the upgrade. I find it cont at all intuitively. For example, when I narrow down to a particular category and cannot go lower anymore, I am still left with a lot of posts and I can’t seem to be able to filter by size, which would be great. Also, a lot of ‘sold’ posts clutter the listings. When you want to browse, it’s very frustrating. I stopped doing anything more than the odd look since the last change wayback when. It's hard to see and find stuff compared to my memories. There is no foot pain so severe, no dress shoe so fragile, no commute so arduous as to justify the sartorial holocaust that is wearing sneakers with a suit. 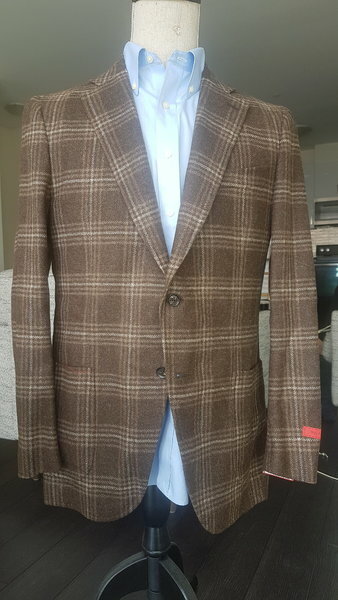 This is a nice sport coat at a fair price. I think it's just the light. The tags are still on it. The colors look better in the closeup photos. I've yet to buy anything in B&S, but I peruse from time to time. Being able to filter by size would be a boon. It's also disappointing that everything gets bumped over and over but there's no price reduction. Being in sales, I'm used to clients who overprice and are then annoyed that the property won't sell or that they get "lowballed" with offers at market. Also, at least on my (despised) Samsung, all the photos are cut in half. I can only see the left side of the photos, so if I'm curious, I need to switch to my iPad or laptop. Edit: Oh yes . Having to scroll past the disclaimer on every single thing wears really thin. I get it, I guess. Modern, litigious world. But lord it's tiresome. Instead of waiting for a price reduction, bid the seller if you are a serious buyer. I almost never go there anymore. Lots of over-priced RLPL but little else of interest. Very hard to navigate and search as well. While you're at liberty to do what you may, please, please do not take advantage of this community and flip things that good folks on here are offering at a lower price to other fellow enthusiasts and hobbyists. Hi, Anyone trying to get rid of there Barbour Beaufort Glenplaid tweed coat ? Might ask him to ship abroad. Have this exact jacket, it’s dank, and available at a fraction of what I paid.